You can copy documents onto plain paper or Epson special papers. To print more than one copy, press + or - to select the number (up to 99). 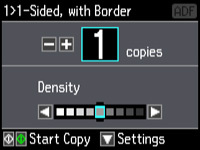 If you need to adjust the darkness of your copy, press the left or right arrow buttons to change the Density setting. Press the down arrow and then press OK to view and change additional copy settings, if necessary. Note: To cancel printing, press Stop/Reset.